Juniata's Bryson Clark, in blue, is fouled by East Juniata's Wayne Dressler during the last shot of the game. Clark made one of the free throws to win the game. 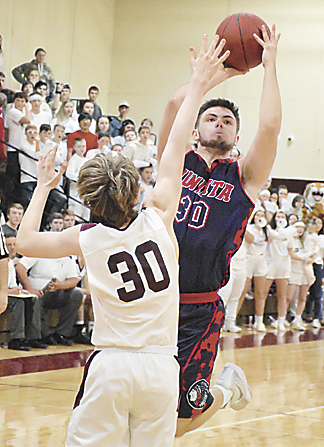 COCOLAUMUS — It came down to a free-throw as Juniata came out victorious in its season finale against cross-county rival East Juniata by the score of 39-38 in a Tri-Valley League boys basketball game Friday night. With the score tied at 27 going into the fourth quarter, each team gave and took its best shot at one another as no one was able to get an edge. Juniata had the ball within the final 15 seconds of the game and were looking to hold on to the ball for the last shot. Clark had the ball in his hands and drove into the lane and was fouled by the Tigers with just two seconds left putting him on the line. Clark missed the first free-throw and had missed what was thought to be a second attempt but East Juniata had called a timeout. Clark made good on his second chance and nailed the free-throw to put the Indians up by one. East Juniata wasn’t going away quietly as with one second left remaining, the Tigers made an incredible full court pass which was caught by Wayne Dressler who was unable to turn and fire off a shot. Things didn’t really start off well offensively for either team as both the Indians and the Tigers failed to connect with shots. For Juniata most of its points came from Devon Nealman who dropped all nine of his points in the first half of the game and Emmanuel O’Donell who came off the bench and contributed to the offense scoring all six of his points in the opening half as well. A large part of Juniata’s struggles offensively was the strong defensive effort by the Tigers who held Clark scoreless throughout the first half. Unfortunately for East Juniata, Clark came through on defense as he made Xavier Clement struggle to get going offensively as well being held without a bucket for the first three quarters. Clement had four points in the game. 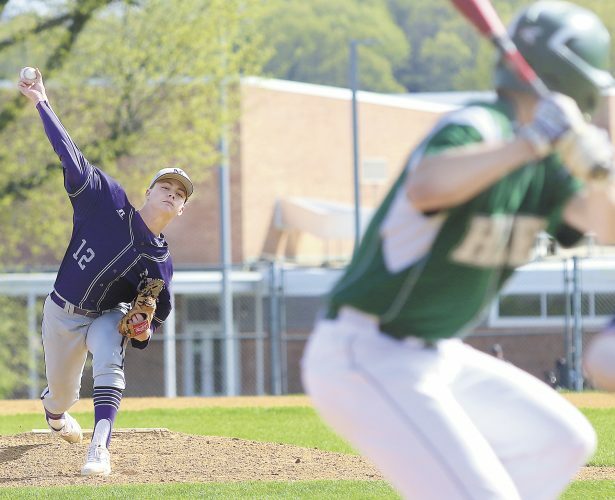 “We needed to set some better screens for him and Bryson Clark did a good job,” Smith said. “What we tried to do coming out of halftime was set some ball screens to free him up. Dressler led East Juniata with 14 points in the game while Evan Reichenbach and Tanner Barth each had eight points. Tylor Gomez put on a show in the second half scoring all 14 of his points in the final two quarters doing most of his damage in the fourth to give the Indians the best chance to win. The Indians also won the JV game, 32-25. Jace White led the way with 10 points for the Indians. The Tigers high scorer was Josh Carlino who had 14. 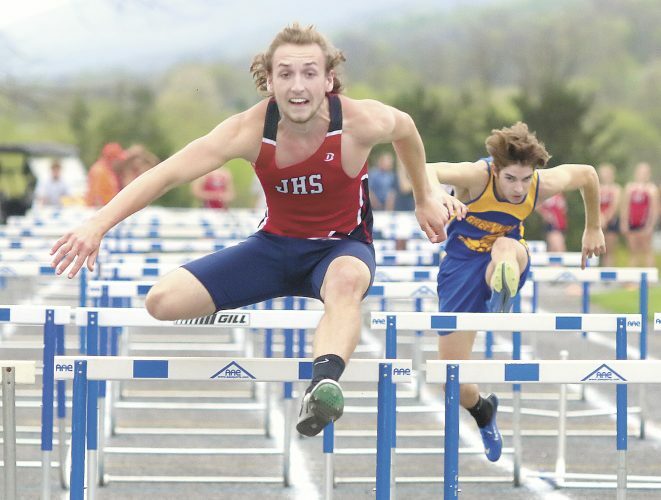 Juniata finished the regular season 10-12. 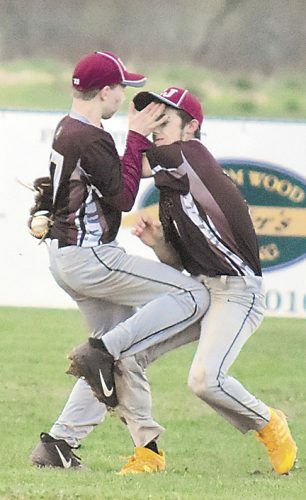 East Juniata (8-13, 4-12) hosts Southern Huntingdon in its final regular season game Monday. Devon Nealman 3 0-0 9, Jacob Condo 1 0-0 2, Manny O’Donell 3 0-1 6, Bryson Clark 2 2-4 8, Tylor Gomez 6 2-2 14. Totals: 15 4-7 39. 3-point goals: Nealman 3, Clark 2. Did not score: Jamie Bailer. Xavier Clement 2 0-0 4, Evan Reichenbach 4 0-0 8, Andrew Hunter 0 2-2 2, Wayne Dressler 5 4-6 14, Tanner Barth 3 2-2 8, Brody Powell 1 0-0 2. Totals: 15 8-10 38. Did not score: Glenn Erdly.